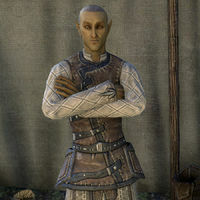 Aesril is an Altmer tailor who can be found at his shop, Breeze Weavers, in Skywatch. He shares a storefront with Ulando and Sircantir, who collectively refer to themselves as the "Brothers in Arms". When spoken to, he'll say, "Stars guide you, traveler. Robes for the discerning spellcaster, right here. With the Brothers in Arms."